Are you looking for an Excel formula to count characters in a cell? If so, then you have certainly landed up on the right page. This short tutorial will teach you how you can use the LEN function to count characters in Excel, with or without spaces. Of all Excel functions, LEN is arguably the easiest and most straightforward one. The name of the function is easy to remember, it's nothing else but the first 3 characters of the word "length". And it is what the LEN function actually does - returns the length of a text string, or length of a cell. 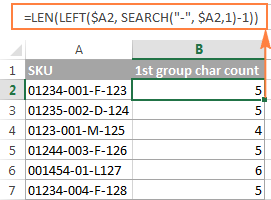 To put it differently, you use the LEN function in Excel to count all characters in a cell, including letters, numbers, special characters, and all spaces. In this short tutorial, we are going to cast a quick look at the syntax first, and then have a closer look at some useful formula examples to count characters in your Excel worksheets. Where text is the text string for which you want to count the number of characters. Nothing could be easier, right? Below you will find a couple of simple formulas to get the basic idea of what the Excel LEN function does. =LEN(123) - returns 3, because 3 numbers are supplied to the text argument. =LEN("good") - returns 4, because the word good contains 4 letters. 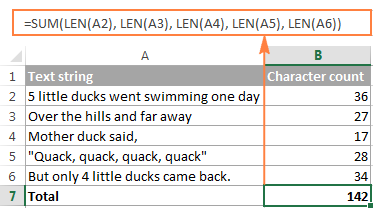 Like any other Excel formula, LEN requires enclosing text strings double quotes, which are not counted. In your real-life LEN formulas, you are likely to supply cell references rather than numbers or text strings, to count characters in a specific cell or a range of cells. More meaningful examples with detailed explanations and screenshots follow below. At first sight, the LEN function looks so simple that hardly requires any further explanation. However, there are some useful tricks that could help you tweak your Excel Len formula for your specific needs. 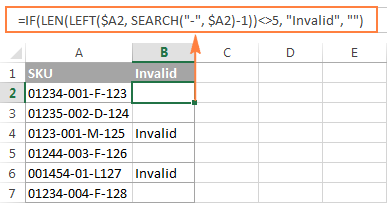 As already mentioned, the Excel LEN function counts absolutely all characters in a specified cell, including all spaces - leading, trailing spaces, and spaces between words. As shown in the below screenshot, our LEN formula counted 36 characters including 29 letters, 1 number, and 6 spaces. 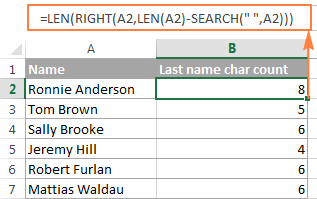 To count characters in multiple cells, select the cell with your Len formula and copy it to other cells, for example by dragging the fill handle. For the detailed instructions, please see How to copy formula in Excel. 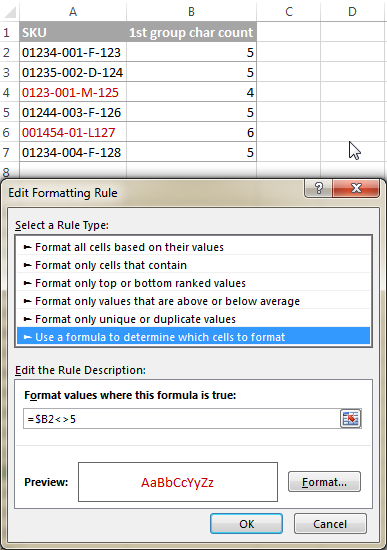 As soon as the formula is copied, the LEN function will return the character count for each cell individually. Note. When copying a formula down the column, be sure to use a relative cell reference like LEN(A1), or a mixed reference like LEN($A1) that fixes only the column, so that your Len formula will properly adjust for the new location. For more information, please check out Using absolute and relative cell references in Excel. This approach is undoubtedly easy-to-understand and easy-to-use, but it's not the best way to count characters in a range consisting of, say, 100 or 1000 cells. In this case, you'd better use the SUM and LEN functions in an array formula, and I will show you an example in our next article. When working with big worksheets, a common problem is leading or trailing spaces, i.e. extra spaces at the beginning or at the end of the items. You would hardly notice them on the sheet, but after you've faced them a couple of times, you learn to beware of them. As you probably know, the SUBSTITUTE function replaces one character with another. In the above formula, you replace a space (" ") with nothing, i.e. with an empty text string (""). And because you embed SUBSTITUTE in the LEN function, the substitution is not actually made in cells, it just instructs your LEN formula to calculate the length of string without any spaces. You can find a more detailed explanation of the Excel SUBSTITUTE function here: Most popular Excel functions with formula examples. Occasionally, you may need to know the length of a certain part of a text string, rather than count the total number of characters in a cell. And all valid SKUs have exactly 5 characters in the first group. How do you spot invalid items? Yep, by counting the number of characters before the first dash. And now, let's break down the formula so that you can understand its logic. And finally, you have the LEN function to return the length of that string. In a similar manner, you can use the Excel LEN function to count the number of characters after a specific character. After that, you have the RIGHT function to return all characters after the space. And finally, you use the LEN function to get the length of string returned by the RIGHT function. Please note, for the formula to work correctly, each cell should contain just one space, i.e. only the First and Last name, with no middle names, titles or suffixes. Well, this is how you use LEN formulas in Excel. If you want to have a closer look at the examples discussed in this tutorial, you are welcome to download a sample Excel LEN workbook. In the meantime, I thank you for reading and hope to see you on our blog soon! 12 Responses to "How to use LEN function in Excel to count characters in a cell"
Very nice article Svetlana.. keep it up ! Need to get... John Thomas only with no spaces etc. Formulas do not recognise the last space as the one before the numbers 215, do not know why. So using the formulas regarding "last space" does not work for this. I also use ; and not , in my formulas. This information is invaluable, priceless, totally useful and completely simple. I have been SEARCHING for a line of EXCEL code that would count the characters in a cell minus the spaces. For example suppose cell A3 contained "1 2 3 4". =LEN(A3) would return 7 as the answer. =LEN(SUBSTITUTE(A3," ","")) would return 4 as the answer. That is what I was looking for. I found other sites that suggested VBA language/code to do the same thing. Just that piece of information makes your site great. I will visit you again. Len function count wrong number in the cell such as in each cell has only 15 digits but I used LEN function to count them, it has shown 17 digits. Thanks so much for your solving. Is it possible to get an accurate count of values separated by both a comma and a dash? C8 contains 11 values separated by a comma (C293-C297 is counted as 1), but I'm curious if the last value (C293-C297) can be counted as C293, C294, C295, C296, C297, giving me the total of 15 that I'm looking for? How would you write a macro to replace "=LEN(LEFT($A2, SEARCH("-", $A2)-1))"
I tried: Range("D3").FormulaR1C1 = Len(Left(Selection.Offset(-1, 0), Find(". ", Selection.Offset(-1, 0)))) to get the number of characters in Range("C3").